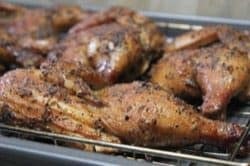 Smoked cornish hens are delicious all on their own and they are the perfect-sized chicken but to make them even better, these are marinated in citrus juices, olive oil and rosemary. 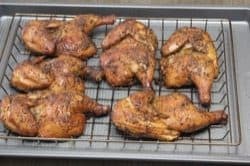 Unlike most of my other recipes for smoked cornish hens, these are topped with the Texas style rub (purchase recipes here) for even more incredible flavor. The sweet potatoes in the picture above are smoked as well.. make them savory or sweeten them up with butter and brown sugar, delectable either way! 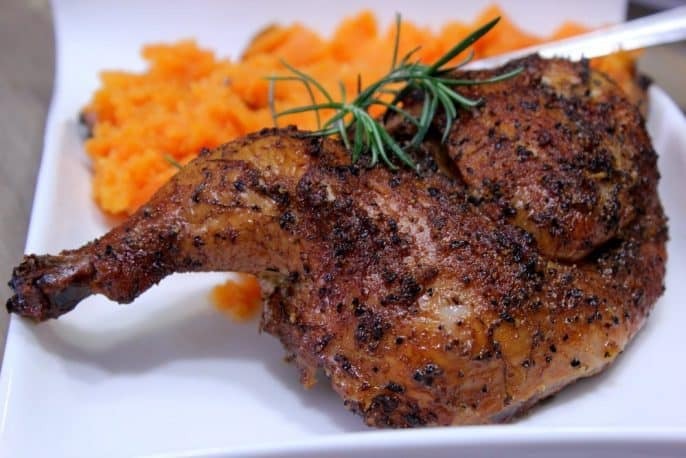 Both of my rub recipes are great options for these smoked cornish hens. 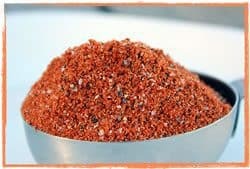 In this recipe, the Texas style rub really pairs well with the citrus rosemary marinade and creates a flavor that will make you smile. Pour 3 cups of olive oil into a medium sized mixing bowl. Zest the oranges, lemons and limes to get about 1/3 cup of each. You should end up with about a cup of zest total. Juice the zested oranges, lemons and limes to acquire about a cup of juice. Remove the leaves from rosemary and chop them to get about ¼ cup of chopped rosemary leaves. 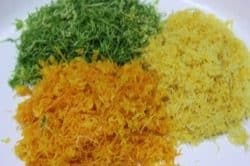 Add the citrus zest, all of the juice, the chopped rosemary leaves, the salt and pepper and the minced garlic into the bowl of olive oil and mix well. You can cook cornish hens whole but I recommend cutting these in half. To accomplish this, it is best to cut out the back bone. This is easy to do with kitchen shears since the bones of these little chickens are quite small. Set the cornish hens on a sturdy surface. Spin the hen around to once again cut along the other side and remove the backbone. Cut along both sides of the keel bone (along the center of the breast opposite the backbone) to separate the halves. The little chickens are now ready for the marinade. Place the chicken halves into a large lidded bowl. Pour the marinade over the chicken stirring as you pour to keep the ingredients evenly dispersed. 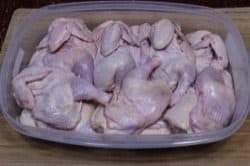 Put the lid on the container and place the chicken into the fridge for 12-14 hours. Move the chicken around 2-3 times during this process to ensure they all get marinated evenly. 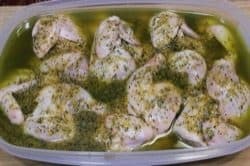 At the end of the marinating process DO NOT RINSE the chicken. Place the chicken onto Bradley racks, cooling racks or you can use Weber grill pans. Tip: they’ll be messy so you will probably want to place something under the racks to catch the drips. I used my Texas style rub (purchase recipes here) on these and it was an excellent decision! Just the right touch! Don’t go overboard.. just a light sprinkle on the skin side will be perfect. I used the Landmann propane smoker for these but any smoker will work great for these as long as you can maintain normal smoking temperatures or a little higher. Setup your smoker for cooking these at 275°F if you can. 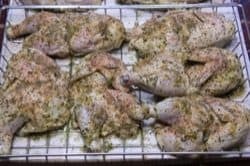 Unlike many of the things that we cook in the smoker, chicken doesn’t benefit so much from low and slow. 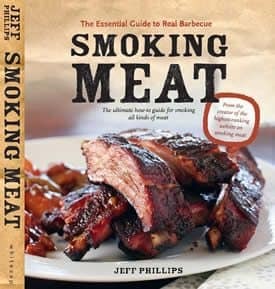 The only reason for cooking them slow is to give them more time with the smoke. For smoke, use orange wood or citrus wood if you have it. Any fruit wood will work great or even pecan, oak or hickory if that is all you have. I did not use the water pan with these to help the skin to dry and hopefully crisp a little more. When the smoker is ready, place the chicken directly on the smoker grates skin side up or you can just place the racks right in the smoker. Give them smoke the entire time if possible and expect them to get done in approximately 1 hour and 15 minutes if you maintain 275°F. Obviously, if you have to cook at a lower temperature, then it will take longer for the cornish hens to finish. I did not baste them or turn them during the cooking process. When they reach 162°F, they can be removed from the smoker. 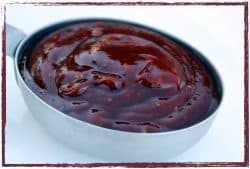 They will continue to cook for a few minutes (carryover cooking) and the temperature will continue to rise a few degrees bringing them up to the proper safe temperature of 165°F. Note: There is no way to tell if food is safely done without an accurate thermometer. I used the “Smoke” by Thermoworks to ensure these were properly done and safe for my guests. These can be served immediately. Serve them with some smoked sweet potatoes or another side or two of your choosing. 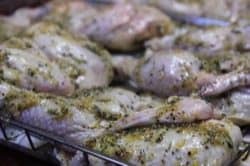 Smoked cornish hens are delicious and the perfect-sized chicken but to make them even better, these are marinated in citrus juices, olive oil and rosemary. 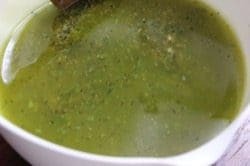 Make the marinade by adding 3 cups of olive oil to a medium sized mixing bowl. Zest about ⅓ cup each of the oranges, lemons and limes. 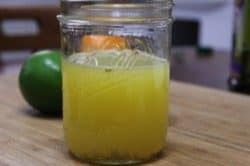 Squeeze the oranges, lemons and limes to get about 1 full cup of juice. Add the zest, juice, chopped rosemary, minced garlic, salt and pepper to the olive oil and stir well to combine. 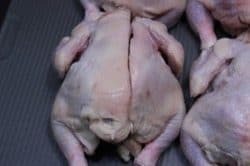 Halve the cornish hens by removing the backbone and the keel bone along the breast..
Add the half chickens to a lidded container and pour the marinade over the chicken to cover. 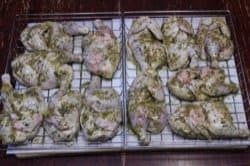 Place the chicken in the fridge for 12 hours. Do not rinse when finished. Sprinkle a thin layer of Jeff’s Texas style rub onto the skin side of the chicken halves. 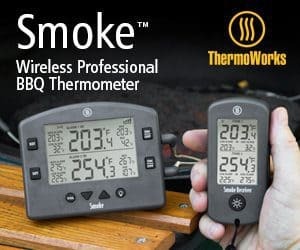 Setup your smoker for cooking at about 275°F if possible using orange wood, or any citrus/fruit wood or even pecan, oak or hickory if that is all you have. 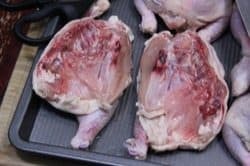 Place the chicken on the smoker grates skin side up. 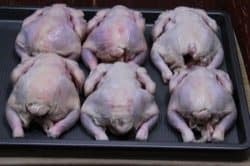 Cook the cornish hens for about 1 hour and 15 minutes at 275 °F or until they reach 165 °F in the thickest part as measured by a meat thermometer. When the chicken is done, it can be served immediately.